Gathering motivation to learn new skills. 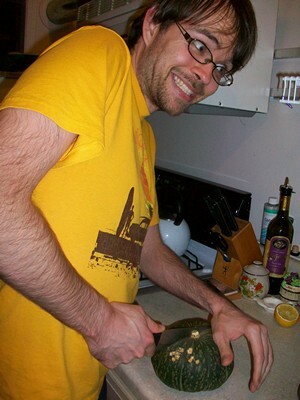 Ryan tries his hand (without cutting it off) at chopping a kabocha squash for the first time after watching a how-to video online. It’s “Cooking Camp Day Two”, and I do have progress to report! It’s still tough to get going on breaking bad habits and developing new ones, but the motivation is slowly building. 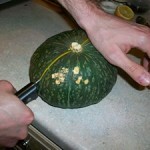 I’m getting excited to peer into books on cooking, learn about the history of spices, and attempt to chop a kabocha squash. (shown in picture) Yes, I cut it! Ryan got the hardest parts cut in half, and I learned how to saw my way through the other parts. 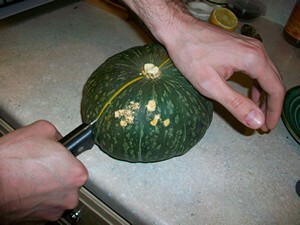 It was quite an empowering experience, but I’m not making a nightly habit out of cutting kabocha, that’s for sure. If you feel up to the challenge, see the recipe for this unique and nourishing soup. We would’ve used a lot less apple, and fresh rosemary, if we’d have tried it before. Success! We’re both able to cut the squash after much effort. List all the successes I’ve had cooking in the past! Celebrate each new success.